On September 12, 2003 Big John Cash died, but not the songs. The echo still reverberates because no grave can ever entomb his music. Balanced on a tightrope of living recklessly, he was accident prone and had cheated death numerous times. He smoked cigarettes for most of his adult life. He also abused his body with amphetamines and barbiturates for over a decade. However, Johnny Cash had a spiritual antenna with heightened sensitivity. Cash’s friend and fellow Highwaymen Kris Kristofferson once referred to him as the Holy Terror. In 1997, Cash was diagnosed with Shy-Drager syndrome. It is a neurodegenerative disease under the Multiple System Atrophy (MSA) umbrella. He began receiving treatment for it, but later it was determined that he had autonomic neuropathy, which is usually associated with diabetes. The illness slowed Cash down and cramped his concert schedule. There was a bout of pneumonia in 1998 that hospitalized him and severely damaged his lungs, but nothing could silence his extraordinary baritone voice. In the recording studio he responded to the health issues and sent a message to the Grim Reaper by constructing back to back brilliant albums: American III: Solitary Man in 2000, followed by American IV: The Man Comes Around in 2002. On American IV, he covered Hurt, a song by Nine Inch Nails. The video of it is a visually stunning, soul-searching examination of life and death. It is often regarded as Cash’s epitaph. Born and raised in a home where Christianity was integrated into the hard life of sharecroppers, Cash learned to love music by singing gospel songs and hymns. His faith was genuine, but so was rebellion. The future man in black had a streak of the rebel embroidered on his soul. At the beginnings of rock and roll, Cash was an innovator and creative force on its cutting edge. He conquered the rockabilly scene in the 1950s and went on to shape the direction of country music in the 1960s. Musically, he’s been called a three-chord cowboy, but he managed to develop a unique sound that was completely his own. Lots of imitators have labored in his wake, but none have ever improved on the boom-chicka-boom signature. In an era when it was common in the contracts for actors and entertainers to have a morals clause, Cash lived on the edge. 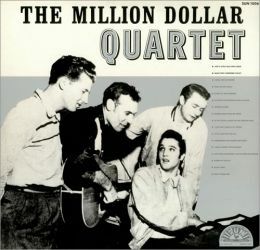 After signing a deal with Sun Records in 1955, he maintained a grueling road schedule with other budding superstars Elvis Presley, Carl Perkins and Jerry Lee Lewis. When one-night stands and constant touring wore him down he started popping amphetamines. Once he crossed that line, it was a downward slide that crept perilously close to death. Like the thief who comes only to steal, kill, and destroy, the drugs dug into him, taking control to distort his perception. 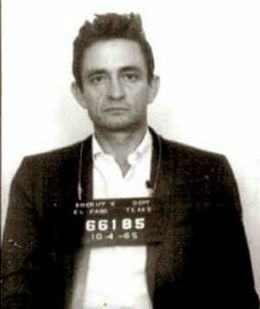 Long before the term was popularized by the likes of Waylon Jennings, Willie Nelson and Tompall Glaser, Johnny Cash was an outlaw both in the music industry and in real life. There was a highly publicized arrest in El Paso, TX in 1965. The narcotics squad suspected he was smuggling heroin, but it was prescription narcotics and amphetamines stashed in his guitar case, so he received a suspended sentence. There was also a night in jail in Starkville, Mississippi for trespassing that resulted in a rather sardonic song about picking flowers. All together he had seven misdemeanor run-ins with the law, spending one night in county jail each time. Through it all, the faith in Jesus Christ which he’d embraced as a young boy, was obscured inside self-destructive behavior. It was always there locked behind a door inside his heart. In 1968, while in a drug-addled state of confused exhaustion, suicide was on his mind; it was that faith that rescued him. 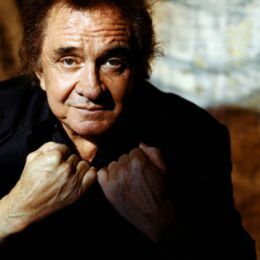 In the early 1990s, though Cash was a legend several times over, Nashville had given up on him. There’d been a string of albums that had flopped and Columbia Records, his home since 1959, had cut him loose. Rick Rubin, the head and visionary catalyst of the newly minted American Recordings label, had an idea. He approached Cash with the proposal and offered him a contract. 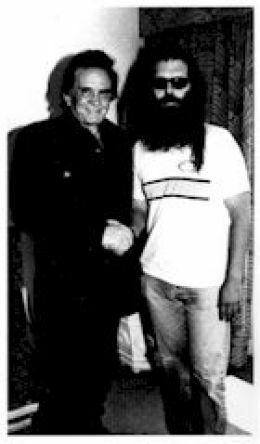 When Johnny Cash teamed up with Rick Rubin, it rejuvenated him, and brought his reputation and presence to a new generational circle. Rubin was best known for his work in rap and hard rock, and although Cash’s career had shattered musical boundaries, on the surface this appeared to be an unlikely combination of talent. The first effort was a collection of original compositions along with several covers of contemporary artists, recorded in Cash’s livingroom accompanied only by his guitar. Released as American Recordings in 1994, it garnered critical acclaim and won a Grammy Award for Best Contemporary Folk Album. It also cemented a friendship between Cash and Rubin, which kept their creative energy juiced up. Their partnership spawned a series of commercially successful and highly influential masterpieces. When it came out posthumously in July 2006, American V: A Hundred Highways was reputed to be their final collaboration. It debuted at number one on Billboard’s Top 200 album list for the week ending July 22, 2006. That achievement sent Rubin back to rummaging through all the tapes from their sessions together. On February 23, 2010 American VI: Ain’t No Grave was released. It came with great expectation because Rick Rubin was adamant that he’d never tarnish the Cash canon. He said that if he couldn’t produce a work up to the high standards of their previous endeavors then American V would be the last word. American VI: Ain’t No Grave doesn’t disappoint. Its stripped down sound is stark and deeply personal, exploring some of the quagmire quandaries of life. 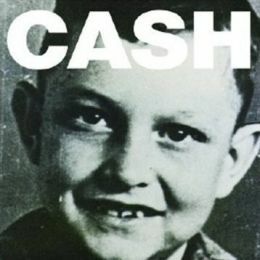 Like much of Cash’s catalog, it’s a near-mystic journey of faith tracking down salvation over a landscape of adversity and the sheer challenge of living. It’s an intimate portrait of Big John Cash worthy of his memory.